Originally, the Washington State Parks department was planning on Sinking the beautiful yacht Governor John Rogers as an Underwater Scuba Park in Ewing Cove (Sucia Island). It had previously been a state fisheries patrol boat and providing fish habitat seemed like a fitting end to a grand old girl. David and Jim Dickinson convinced the state to save the Governor John Rogers and traded two vessels to be sunk instead. 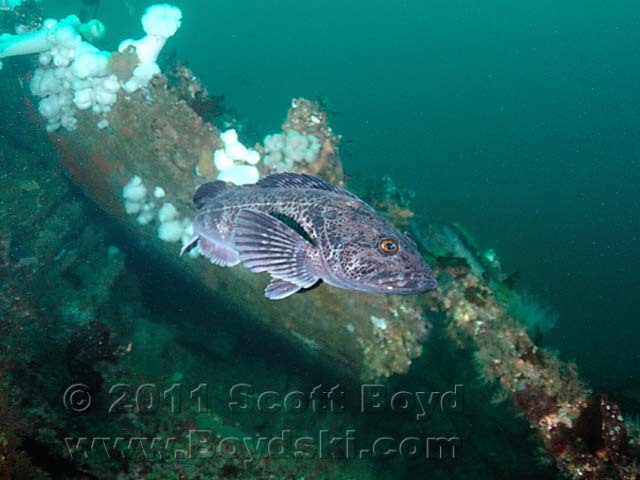 The Lady Alyce was a tired old Salmon Troller (~ 40' long) that was barely being kept afloat with a failing bilge pump. She was towed out to Ewing Cove, nearly sinking along the way before the generator on the tow vessel was shut down and the Lady Alyce sank in the charted Fish Haven at the South Entrance. A second vessel, which may be the Noah, was later sunk in the same location. Since then, a steel hulled barge has been added and piles of large steel I-beams have built up the site. This "underwater park" is a bit current sensitive due to the flow in and out of Ewing Cove, but is loaded with marine life and is well worth the effort to visit for those that are hanging out at beautiful Sucia Island. 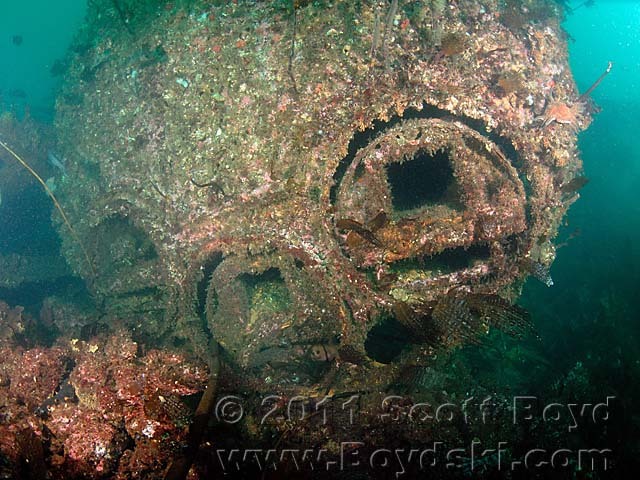 The wrecks, barge and I-beams are laying against a ridge of rock that comes to within 15' of the surface. The site itself is almost 200' long, about 35' deep with the bow of the Lady Alyce pointing North. 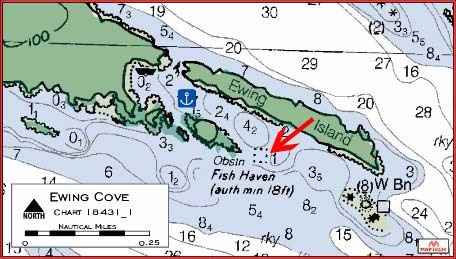 The location of the fish haven is well charted, with the wrecks just East of the center of the charted location, laying against the 1 fathom obstruction. Location: South Entrance to Ewing Cove at Sucia Island, San Juan Islands. Depth: 30-40' Hazards: Strong Currents, Surge, Kelp, lots of pleasure boats.